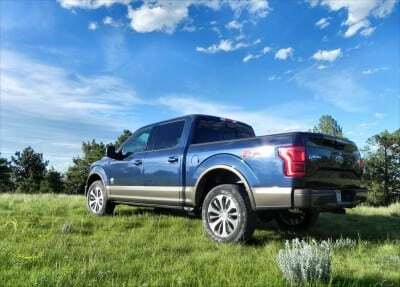 The fully-redesigned Ford F-150 has famously been made of aluminum. So how does it do out in the real world and, perhaps more importantly, how does this affect the King of all Ranch trucks? 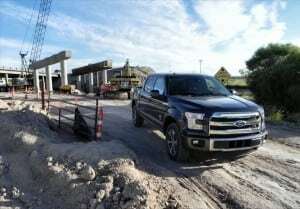 To many, the idea that Ford replaced all of the sheet steel on its F-150 truck – the most popular truck and, indeed, the most popular vehicle in the country – was a shock to many. Rumors and assumptions began to fly about the costs associated with this, the aftermarket repair wasteland it would create, and the durability of the aluminum choice. For the most part, it seems, those assumptions and memes began to wear themselves out as the actual truck hit the streets, farms, and workshops of the country. 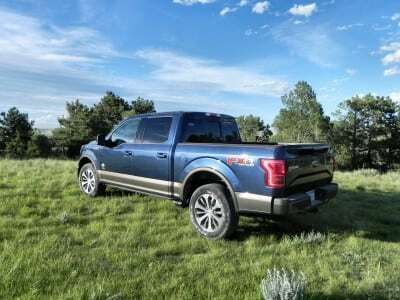 Insurance doesn’t seem to be more expensive, repair shops are acclimating to the needs of the F-150 (which at this point is warranted and repaired at dealerships anyway), and buyers seem to feel that they are just as tough and durable as they were before. 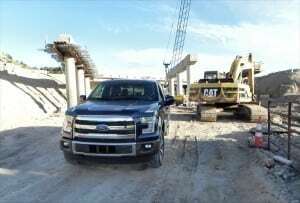 The Ford F-series is the most-produced vehicle in North America and may be in contention for the world title as well. At the pinnacle of those sales is the F-150 half-ton pickup. At the top of that truck’s lineup is the King Ranch edition. 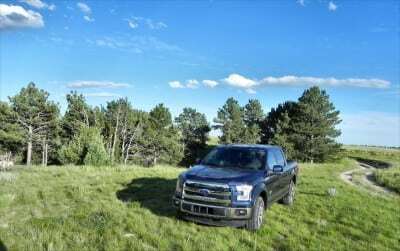 We spent a week with the 2015 Ford F-150 King Ranch and did as much as we could to thoroughly test the truck without going to extremes. We hauled, pulled, and sat and watched others labor around us. You know, because people who own a King Ranch aren’t likely working with their hands in the real world. Right? The Ford F-150 can be had in regular, extended, and crew cabs with seating ranging from three across to up to six. Three different bed lengths are available, depending on the cab type chosen, and five trim levels are offered. Trims start at the base model XL, then the XLT, Lariat, and the shared top-tier King Ranch and Platinum models. Most of the exterior design changes for this new-generation F-150 are subtle with the general theme of the last-generation F-series remaining intact. The grille is less busy with three wide stripes running across it. The headlights were restyled to look like the letter C facing one another from each side, with the top portion leaning back into the fender. The hood remains flat, but sees a little more stamping to make it more aggressive in appearance. The F-150 otherwise remains much the same on its exterior. Inside, though, there’s a difference. For a tarted up, top-shelf edition of a pickup truck, the 2015 F-150 King Ranch is a lot less showy than some rivals. 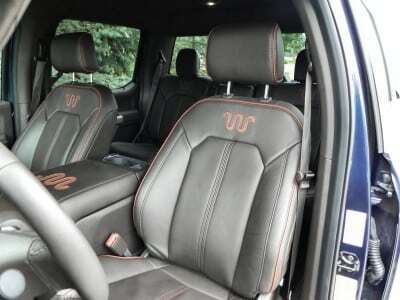 Like the roper at the rodeo whose saddle costs more than the horse he’s riding, some pickup trucks take their topmost “Western” interiors to extremes. Not Ford. 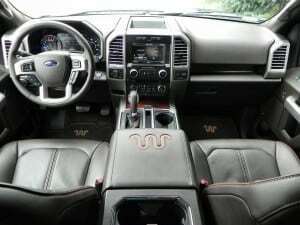 Perhaps in an effort to shed the Bluegrass image of the “Ferd on a dirt road,” the King Ranch has just enough filigree to make sure you know what it is, but not so much that you get assaulted by saddle leather and embossment at every turn. In fact, the F-150 King Ranch’s interior is even.. classy. Seating is very well done with a lot of comfort. One caveat, though: skip the massaging front seats. They become very uncomfortable when the massager isn’t on (which will be most of the time once the novelty wears off). 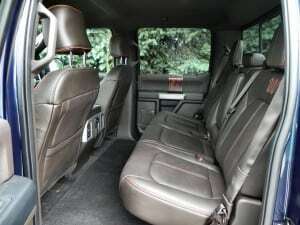 In the CrewCab model we drove, the rear seats were adult-friendly and very comfy. Most pickups in this class can boast that, but in Ford’s case, the extra couple of inches added to the truck’s inside width really adds up. As with most in this category, the F-150 in all trims offers storage under the back seats, nooks and spaces for things like the jack and other tools, plus optional upgrades like moon roofs and such. 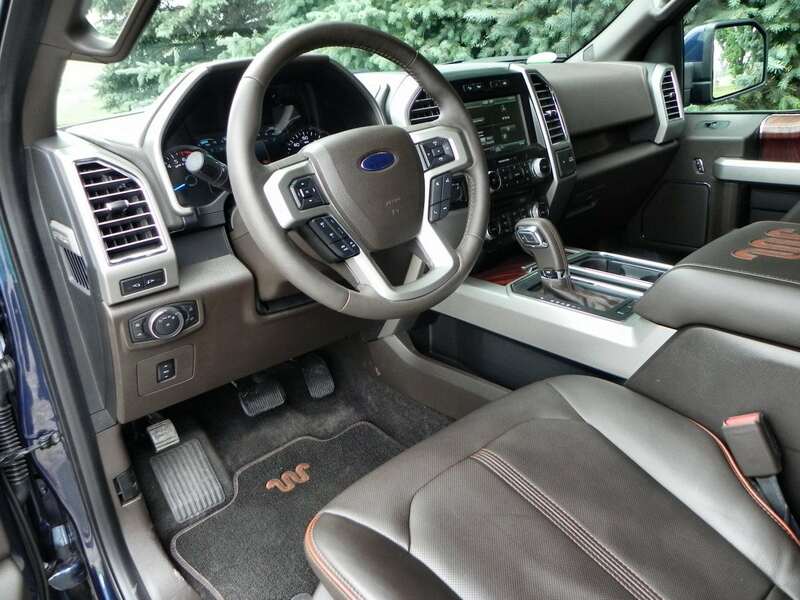 Ergonomics are also very good in the F-150 King Ranch. 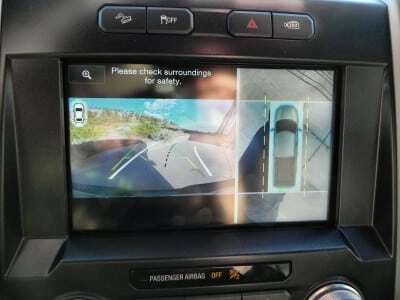 We really enjoyed the new instrument cluster with its 8-inch “productivity screen,” which allows a lot of customization and vehicle information readouts for the driver. It’s especially useful when working with the truck, giving a heads up on things like towing needs, engine outputs, and such. There is a nice array of choices to be made when it comes to interior comfort and niceties. There are four engine options for the 2015 F-150 line and one six-speed automatic transmission for all of them. Things start with the base-level 3.5-liter V6 that produces 283 horsepower and 255 pound-feet of torque. 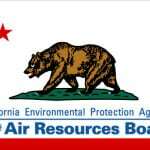 The EPA gives this a rating of 20 mpg combined in two-wheel drive and 19 mpg combined in four-wheel drive. That’s about par for V6-powered full-sized trucks on the market right now. A new 2.7-liter turbocharged V6 producing 325 hp and 375 lb-ft of torque was introduced this year. 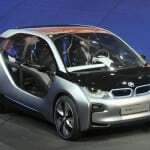 This boosts fuel economy to 22 mpg and 20 mpg combined in rear-wheel and four-wheel drive respectively. 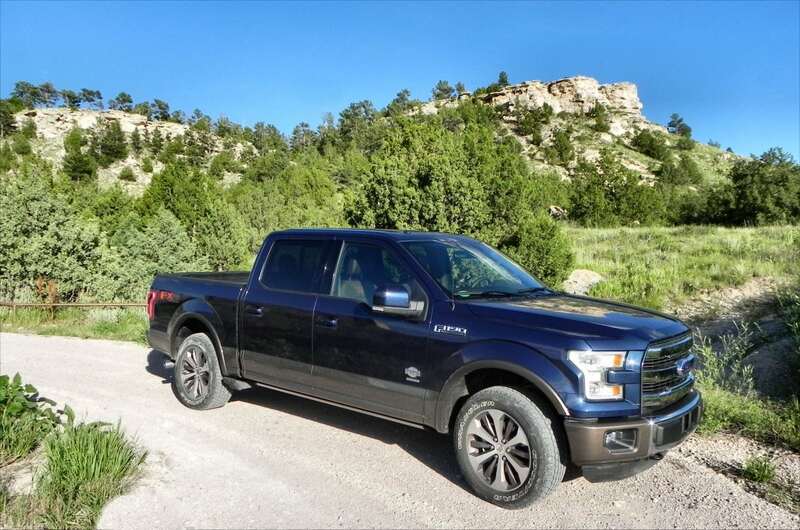 This engine, which we drove briefly earlier this year, embues a sporty, almost car-like appeal to the F-150 and we’ve dubbed this option the “soccer mom edition” for the truck. The two towing and hauling engine options are a 5.0-liter V8 that outputs 385 horses and 387 lb-ft of torque with an EPA rating of 18 and 17 mpg combined in RWD and 4WD respectively. The 3.5-liter turbocharged V6 EcoBoost option, now the most popular engine option in the F-150, returns 365 hp and 420 pound-feet with an EPA rating of 20 and 19 mpg combined (2WD, 4WD). 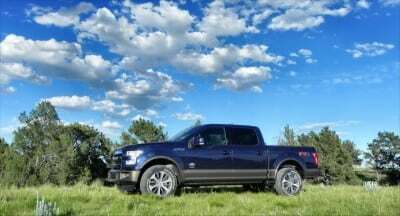 We’ve noted that in every 2015 Ford F-150 model we’ve driven, no matter the engine, things feel lighter and less top heavy thanks to the much lighter bodywork on the truck. In towing, this affects how the load handles, as we’ll discuss next. During our week in the 2015 F-150, we hitched it to a trailer and towed for a while and put a few things in the bed (much as the prospect of potentially scratching this truck pained us) and did some work with it. The F-150 with its 3.5L EcoBoost option offers plenty of power for normal pickup truck jobs. Can you max out the towing regularly and be fine? Honestly, I don’t know, but past experience with any truck tells me that’s not a good way to guarantee long life. 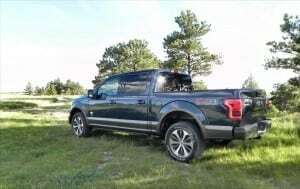 What was obvious with the Ford F-150 King Ranch here is that in this half-ton configuration with the best powertrain (on paper) for towing, it does a fine job of it. Our trailer was a small single-axle box weighing about 5,200 pounds loaded. 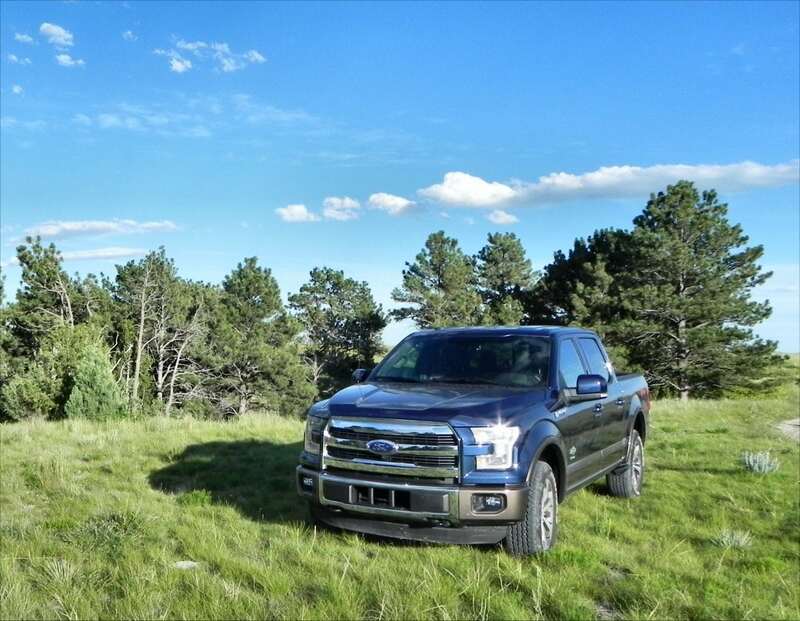 The 2015 F-150 had no trouble getting it around. We did notice a few things that weren’t concerns, but will require a little adjustment for some experienced trailer pullers. First, the backing camera is awesome when lining up to set a hitch. I’ve driven a lot of trucks with a lot of hitch types and with the exception of a day cab big truck with a large back window to easily line up a fifth wheel with a kingpin, I can say that this is the easiest truck I’ve ever used when lining up a ball with a receiver. The next thing was the actual towing. 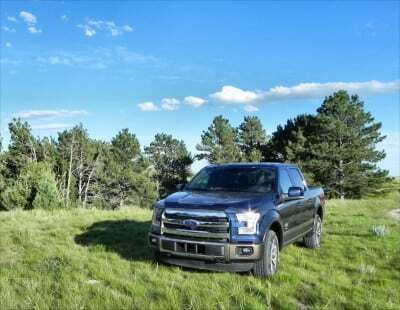 Unlike a diesel engine or a slow-start V8, the turbo V6 in the F-150 really hits it quick. This has good and bad sides. The good side is that getting the trailer moving and up to speed is a cinch. The bad side is that if you’re not prepared for that, you might get a little shaky when the rig starts moving faster than you’d expected. If you have ever hitched up to an empty trailer and then pulled out too fast and had the trailer sway around a bit before settling in, you know what this is like. You get used to it. Another thing was the amount of push and pull. A loaded trailer like ours can try to bully the truck a little. 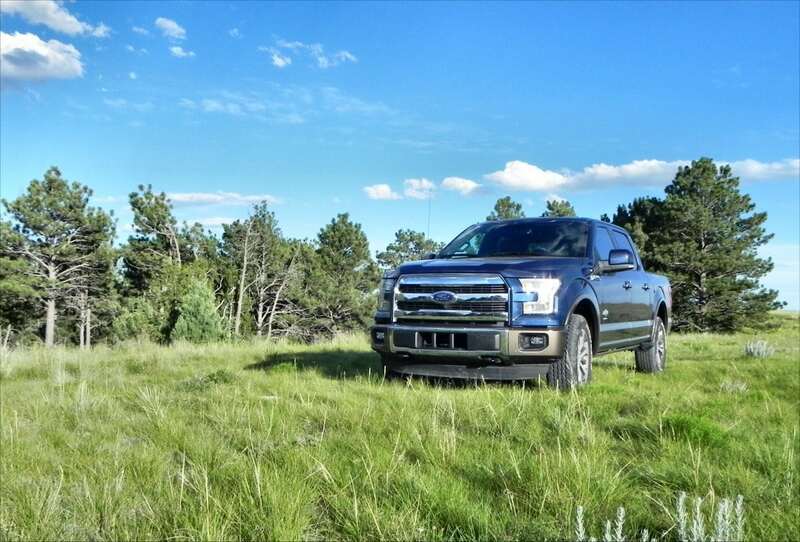 The light weight of the new F-150 means it’s capable of more and gets better fuel economy. It also means it has less mass to control a trailer with. Sway didn’t seem to be an issue, as the truck has a solid footing from the frame down. But the back-and-forth push/pull of a heavier trailer is noticeable. Not enough to cause concern, but enough to make you a little nervous at the first couple of lights you stop for. Once you get used to the idea and begin feathering the brakes a little more, though, it’s no big deal. When the truck is under load (we had about 400 pounds in the bed at another interval), none of this applies. This has to do with physics, obviously, but we want to make it clear that the lighter weight truck body doesn’t affect hauling, so if you do a lot of that, you won’t see anything different with this aluminum truck versus a steel one. One thing about the pickup truck today, it’s more versatile than it’s ever been. Selling in the numbers they do, you’d think that most of the people in this country were plumbers and ranchers and mechanics. The reality, of course, is that we aren’t. So for many, the truck is a lifestyle choice as much as anything else. Justifications are made, of course, but in the end, the point is that the truck has become a family car on top of any occasional towing or home improvement hauling it might be purchased for. Nowhere is that seen more than in the half-ton market. Ford is well aware of this and has put a lot of effort into making the F-150 into a family-capable vehicle. Perhaps more so than any other manufacturer. 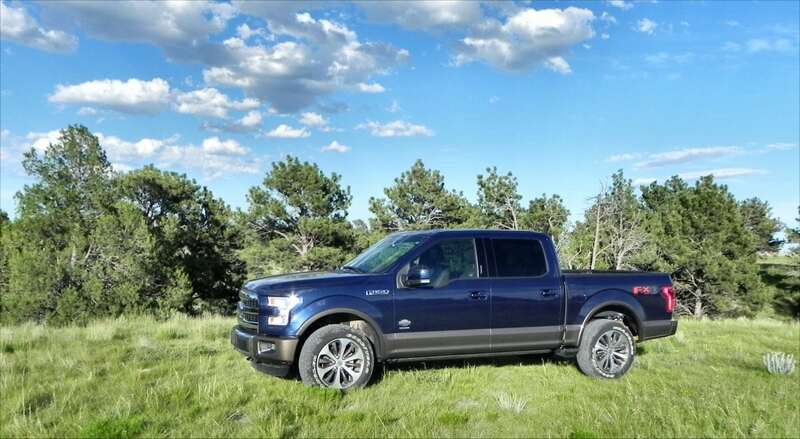 I was told, in hushed whispers out the side of a Ford rep’s mouth while attending an event, that the F-150 with the 2.7L EcoBoost engine and Platinum package is the “ultimate soccer mom vehicle.” It’s big, it’s roomy, it’s safe, and it’s economical. Plus the interior of the Platinum package is comparable to any full-sized luxury sedan you can name. I personally know someone who runs a daycare and she has an F-150 Crew Cab. She traded a big sedan for it. Honest. 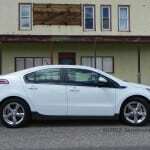 Fuel economy is the same and she has a more versatile vehicle for it. In the King Ranch, the same applies, but with more western flair. We have a four and a five year old, both girls, and they are at that age where they want to climb in on their own, get out on their own, etc. 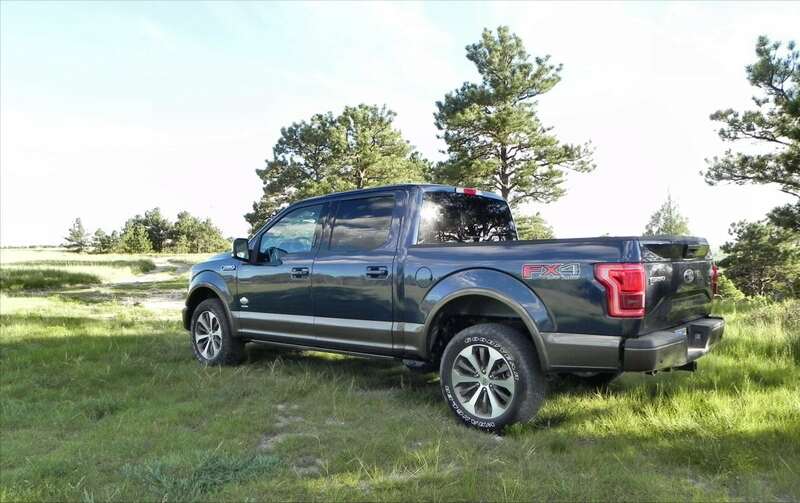 With the F-150 King Ranch and the retracting side steps, they were able to do that. We could have fit three child safety seats across in the back seat, had we wanted to, and still had room to spare. 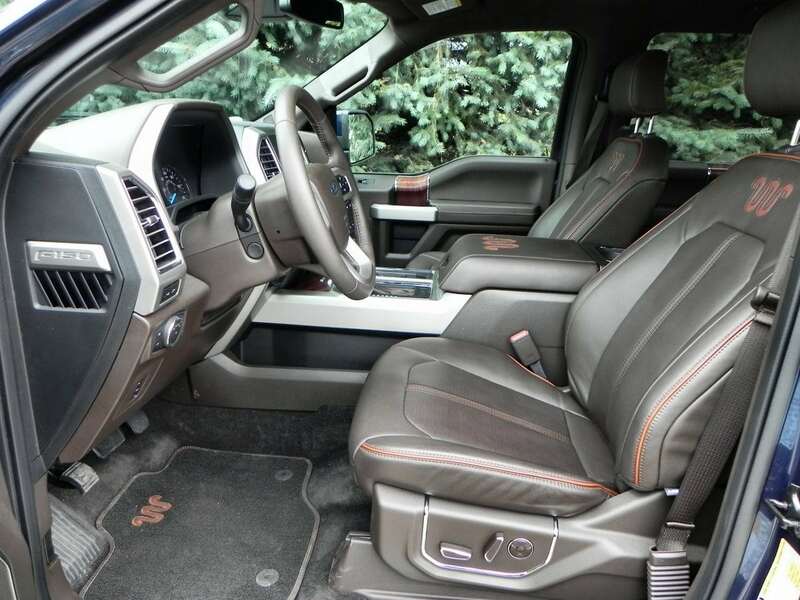 On the road, the F-150 King Ranch is as comfortable as a truck can be, which nowadays is pretty darn comfy. The 2015 F-150 King Ranch took us to t-ball practice, swimming lessons, a museum.. You get the gist. 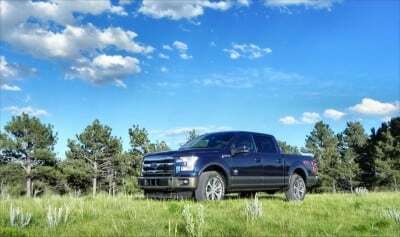 The competition in the full-sized pickup truck category is four-fold against the F-150: the Ram 1500, the Chevrolet/GMC Silverado/Sierra 1500, the Nissan Titan, and the Toyota Tundra. Of those, only the Ram, GM and Toyota models have a top-end competitor for Ford’s King Ranch edition. We’ve driven all of them. The GMC Sierra 1500 Denali is the most direct competitor to the F-150 King Ranch in General Motors offerings. The High Country is another option (in the Chevy lineup), but isn’t as sophisticated and upper crust as is the Denali. We were very impressed with the Sierra 1500 Denali and would be hard-pressed to call the King Ranch better. I think we’d say it’s a draw and comes down largely to preference in look and expectation. The King Ranch is a bit more cowboy (though not much) than the Denali, which is more of a Cadillac. The Ram Laramie Longhorn package is considered the primary contestant against the King Ranch, but to be totally fair, the King Ranch fits somewhere between the Laramie Longhorn and the Limited packages for the Ram 1500. The Laramie Longhorn is extremely western, with an interior that literally has saddles. Or at least parts of them. 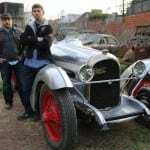 The Limited? Not so much. We’d say that in the end, your choice is likely more about style than need at this level of truck buying. Finally, the Toyota Tundra 1794 is the limited edition package in their line. 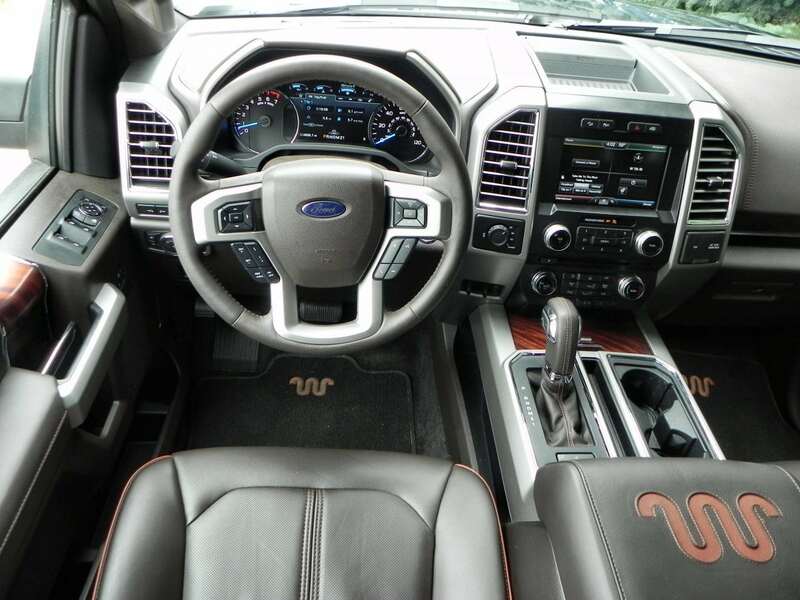 It’s stylistically akin to the King Ranch in many ways, though a bit more cowboy perhaps. It’s also cheaper and has fewer upper-end amenities in trade. The Tundra is a great truck for many reasons, but just doesn’t have the goods to compete at this level of refinement. Slight learning curve to towing operations. In the end, we found the 2015 Ford F-150 King Ranch to be much more refined and enjoyable than expected. 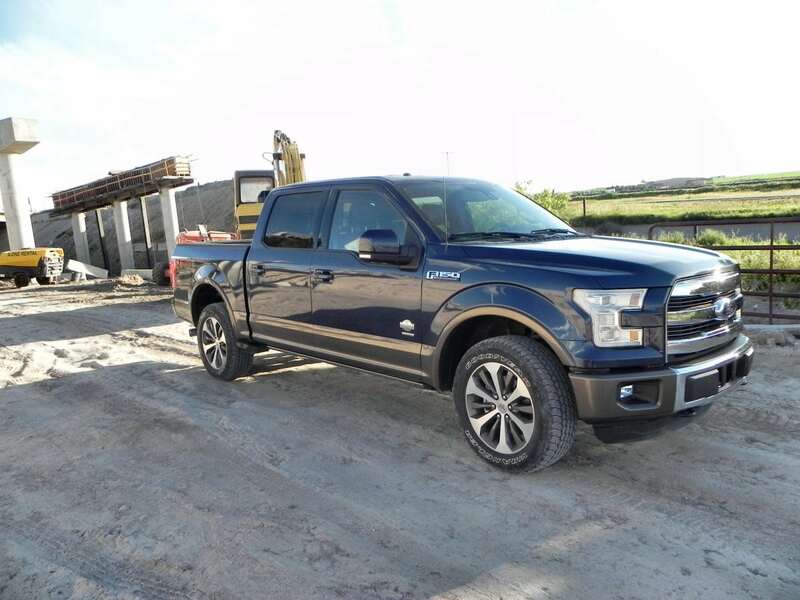 In the past, we’ve been underwhelmed with this truck in comparison to some other options, but the aluminum body, added capability, and much more subtle interior swank all come together in an excellent truck package. The F-150 was a manufacturer’s press loan for about a week. During that time, a total of 255 miles were put on the truck in mixed use scenarios, including towing and hauling and some light and medium offroad.